The scale of today’s food industry combined with the strict standards that it has to comply with means that food and beverage businesses have never faced so many challenges and concerns in order to successfully grow, process and sell products. This is exemplified by the requirements placed on each building component, piece of equipment and production process. Every element has to be carefully considered and thought out to ensure that it will facilitate an ultra-hygienic space and that it will be able to retain its functionality in the face of an intensive food and beverage processing environment. And the floor underfoot is a critical point to start with when designing a new food plant or refurbishing an existing one, as if it is not up to the task at hand then it doesn’t matter how clean and efficient the rest of the site is – it will always be at risk from contamination and bacteria build up. 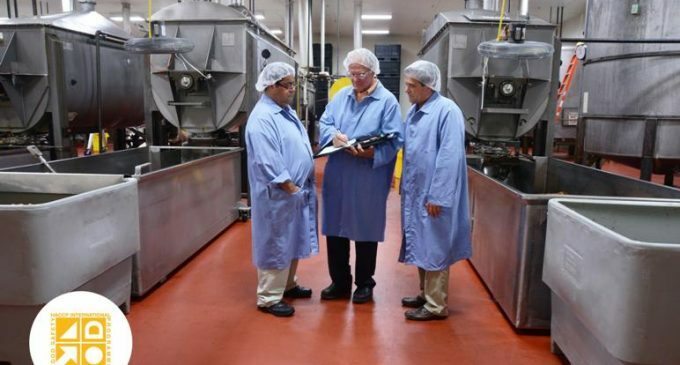 Flowcrete UK has designed the Flowfresh range to provide all the flooring properties that large-scale food facilities require in order to maintain an efficient, sanitary and productive site. Its ability to meet all the strict standards and requirements of food and beverage industry flooring means that Flowfresh has successfully been accredited with HACCP International certification. HACCP International operates a globally recognised product certification scheme that evaluates materials, equipment and services used within the food industry. The robust, impervious nature of Flowfresh leaves nowhere for contaminants to hide, making it a simple task for the site’s cleaning regime to wash away unwanted substances before they can pose a threat. Stainless steel drainage, an important health and safety criteria, can be incorporated into a Flowfresh finish and coving can be added along the floor’s edge to further enhance the facility’s cleanability credentials. Flowcrete UK developed the Flowfresh range out of an exclusive global partnership with Polygiene® to deliver an advanced level of surface protection. The Polygiene® additive consists of a thermosetting amino compound locked into the resin matrix of the flooring material. It continuously emits powerful silver ions that target germs on the surface of the floor, penetrating the cell membrane of the bacteria and causing it irreparable damage. Flowfresh’s ability to inhibit antimicrobial growth has been scientifically verified, as it meets the ISO 22196 standard for measuring a surface’s antibacterial effectiveness. The primary ISO standard test involves the inoculation of a population of microorganisms onto sets of antimicrobial coated and standard materials. This testing shows that over a 24-hour period Flowfresh is able to reduce the amount of bacteria on its surface to practically zero, while on a standard polyurethane floor the bacteria population will be roughly the same as when the test began and on a polypropylene coating the bacteria will have significantly increased in number! As this is a very complex area of industrial flooring, Flowcrete UK has put together a web page full of useful advice and tips to help anyone that would like to learn more about food safe flooring solutions.